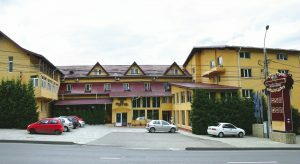 Right in the heart of Bucovina in a pleasant, intimate and relaxing environment, the Casa de Piatră Hotel is the optimal choice for both business and leisure travelers transit. The hotel offers a range of services in different, well-appointed spaces. Whether you want the formal atmosphere of a business meeting or a conference or intimate dinner in two, we are the best choice because we take care of our customers by offering them the best service. As Bucovina is known for its hospitality and the Casa de Piatră Hotel awaits you at the exit of Suceava, about 5 minutes from the city center, 8 minutes from Suceava Fortress and the Village Museum, 7 minutes from the Suceava Inn (Ethnographic Museum) and 10 minutes of malls. In addition to this, only 4.7 km away you will find the Hagigadar Church known as the “Church of Desires”. The Casa de Piatră Hotel offers 3 stars services that combine quality with functionality in a harmonious manner so that customers come back with great interest and confidence each time. We are a relatively small hotel, just 24 rooms , which gives us time to stop the details and ensure our guests a warm atmosphere. The hotel was designed from the perspective of our guest and the benefits he gains by choosing our location: comfort, efficiency, the ability to select from a diverse range of services and attention to detail. You are welcome to visit Casa de Piatră Hotel – a special space that will surely surprise you in a positive way.